The 2011 television series "The Borgias" is thrillingly written, and lavishly presented. There is a great deal to interest the historical costume maker here! 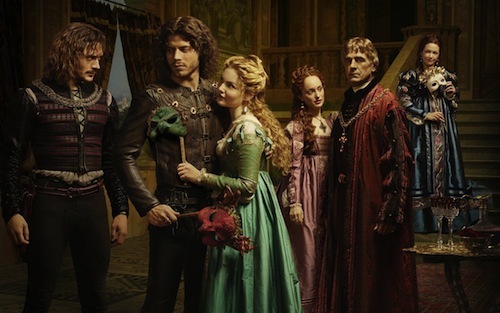 I must confess, after the fiasco of "The Tudors", I was a little bit nervous about watching this series, but I was seriously rewarded for my time. If you have an interest in creating a homemade costume from 15th Century Italy (or any one of its many city states at the time… or France in particular, Spain, and several other surrounding countries at the time), you honestly can't go too far wrong with "The Borgias". The attention to detail is quite staggering. Costume, set and lighting designers alike have worked together to produce setting after setting that has come right out of paintings and frescoes of the period. If you know art of the time, you may even recognise scenes and lighting from many of them, along with clothes from many others. In this series, fashions have been researched and matched to the locations of the stories. If you are in France, the styles will be French. If a visiting ambassador is from the Holy Land or from Spain, the styles will match. Waistlines are correct. The cut of skirts, bodices, chemises and shoes are correct. Hairstyles, headdresses and jewellery are all correct. It really is a feast for the eyes. What is even better? As time passes, so do the fashions. The Production office do not continue to recycle costumes as the year pass in the story. Subsequent seasons keep up with what was being worn in Rome - and elsewhere - at the time the story is set. I am particularly enamoured of the endless gowns worn by Lucrezia and her mother. The detail paid to the baby's clothes is quite amazing, as is the costume of the peasant classes (not just characters, but extras). Some of the biggest costume nuts I know have tried to pick holes in this series and failed. They love it too. * Designers on "The Borgias" have made concession to lacing on the garments of both the men and the women. I suppose that with so many people to dress, it was simply too much to contemplate doing it all up (or losing laces and having to repair and replace lacing rings). For every other effort I can see they have gone to, I completely forgive them for this. *Where real lacing has been used, some of the men's costumes in Season 3 in particular, have not paid attention to the correct lacing styles of the period. Crossed Lacing has been used, where it's more likely that spiral lacing would have been the norm. For more information on lacing, please see my lacing tutorials and other articles on this period. * Some of the mens hosen are a little dubious in their construction. Please research carefully before you use them as gospel in your creations!